Learn about new, unconventional ways to cook your favorite grill foods this summer! Cooking out on the grill and summer are practically synonymous. It is not uncommon this time of year to catch a whiff of charcoals burning nearby or smell sizzling steaks cooking out in your neighbor’s backyard. With smells like that floating through the air how could you not be tempted to fire up your own grill and follow suit? Whether you’re looking to make exceptional barbeque, or tasty shish kabobs, there is an extensive variety of things you can make on the grill. 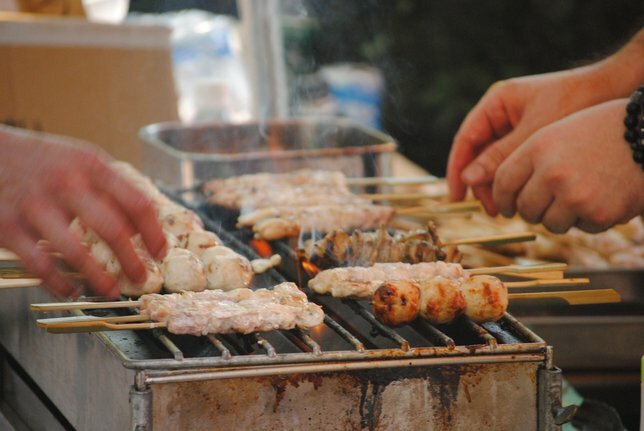 Nowadays there are also many different ways to cook food on the grill in non-traditional ways. With unconventional techniques and special equipment you can get the exact taste, cook as thoroughly as you’d like, and discover new ways to enjoy your favorite grill top recipes. Grilling Plank: Grilling planks give food a great subtle smoky flavor. The results of using these useful wooden planks are perfectly tender meats, sweet and smoky vegetables, and delectable seafood. Your food will retain more moisture during cooking and lessen your need for thick marinades. Grilling Baskets: Handled grilling baskets are a great tool to make use of this summer. They make the turning over process a cinch! Usually when you turn over your burgers and loose vegetables they have a tendency to come apart, stick to the grates, or you lose them all together to the grill in the flipping process. With nonstick handled grilling baskets all you have to do is one swift turning over motion and everything is kept safely inside the basket, ready for the next flip. Salt Block: Great for hot and cold foods, salt blocks enhance the flavors of whatever food you put on it. Chill the block to serve sushi and salad then heat it up to grill meats and vegetables. Salt blocks are very versatile and require little maintenance, simply scrub the surface lightly after using then let air dry. Although they can withstand high temperatures, the blocks need gradual heat to maintain their integrity. Smoker: With a smoker you can perfectly combine the efficiency of gas grilling with the authentic, smoky flavor of charcoal grilling. After soaking, place the wood chips - you can also add in fragrant herbs, in the base of the smoker and heat on the grill. Put the foods you want grilled on the perforated part of the smoker and close the lid while your foods cook and take on that great barbequed, smoky taste. Wire Mesh Roaster: Wire mesh roasters are great and convenient because they allow all of the ingredients to get their fair share of heat time and keep small ingredients safely secure in the pan. You don’t have to worry about small cut up vegetables slipping through the grates or losing as many herbs and spices while you cook. What are some unconventional grilling techniques & tips you have when it comes to cooking on the grill? Let us know in the comments! Subject: LongIsland.com - Your Name sent you Article details of "Unconventional Grilling & Cooking Techniques"